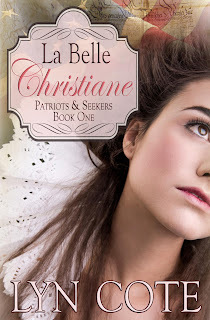 Any author’s first book--even published years late--is the dearest to her heart and this is mine, La Belle Christiane. Anyway I wrote that story without knowing anything about the market. In fact, I told myself just to write the book and then I’d think about marketing it. The thought of that was overwhelming at that time. It took me three years of writing to finish my first manuscript-1,000 handwritten pages. Whew! I found out that while it garnered interest from agents and editors, it never found a publisher. I think that’s because there are “unwritten” rules for inspirational fiction and I didn’t know them or follow them. I still think it’s a good story and I’ve revised it and am revising and improving it once more. Also I didn’t want it to sit ignored on my shelf forever. So now that authors can publish their own books, I did so! Here's the scoop on my firstborn. find a love that will last a lifetime? After her mother's violent murder, Christiane flees France with her renegade father. In the Canadian wilderness, she survives the shock of leaving a life of wealth and privilege. To escape frontier violence, she moves southward only to become involved in the burgeoning American Revolution. Daughter of a French courtesan to frontier wife to companion of Lady Washington, Christiane moves into the heart of the American rebel elite. But one man in her life can never be forgotten. Once he was her friend. Now he has become her enemy. Will he become her destiny? Only God knows. La Belle Christiane will be a free ebook on kindle later this month April 27 through May 1st so mark your calendars! Or click this link and add it to your Wish list. USA Today Bestselling author, Lyn Cote has written over 40 books. A RITA finalist and a Carol Award winner, Lyn writes contemporary romance, romantic suspense and historical novels. Visit her website/blog at http://www.LynCote.com and find her on Facebook, GoodReads and Twitter. I do like family sagas, and I loved this book. Thanks, Jean. I loved family sagas too! I love family sagas, Lyn. Looking forward to this book! Congratulations on your firstborn! :) I understand your writing adventure as I have two kiddos myself and started writing when they were young, though not as young as yours. I love your book cover and the story sounds intriguing! I can't wait to read it. So glad you are enjoying your kiddos! Congratulations!! Writing with young kids is such a challenge. Family sagas are fun to read! Yes, but my kids grew up seeing a mom pursue her dream--a good lesson.